1. Wash and chop the mango. Discard the seed. 3. Dry roast groundnut and sesame seeds. 4. Grind step 2 and 3 with little salt and water to smooth paste. 6. 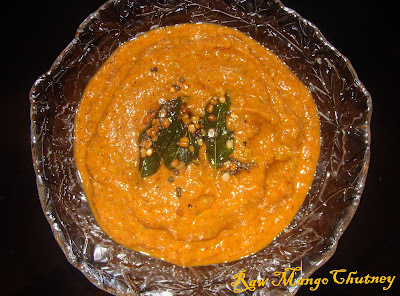 Raw mango chutney goes well with rice, dosa, chapati, idli etc.